Defense Secretary Leon Panetta’s proposal to allow women in the military to serve alongside men in the trenches of combat ignited a national debate – as well as one on the Tarleton campus. Ted Roberts, visiting instructor of U.S. history at Tarleton, said the defense department is doing little more than acknowledging a fact military people already know. 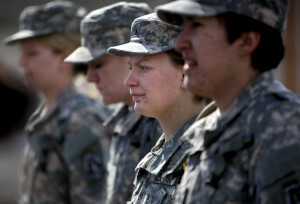 Private Sarah Oliver stands at attention and listens to instruction during a marching formation training session March 23, 2013 at the Army National Guard Armory in Casper, Wyo. Private Oliver was the first woman to sign up to serve in the Artillery with the Wyoming National Guard since the ban on women in combat was lifted last year. Paul Colcleasure, a former Army air traffic controller, and Jason Richards, a former electronics technician in the Marines, aren’t sure the move is in everyone’s best interest. Roberts and Colcleasure say it depends, with both men and women on whether an individual could handle the physical and mental stress of combat. “It takes a particular person on either side; it’s not just a male/female thing,” Richards said. He also says women might not necessarily have to uphold the same physical standards as a man. They could be given a different job or a lighter gun, he suggested. But Roberts, Richards, and Colcleasure believe there should be different standards. “They want female representation in the ranks, but you can’t get that without adjusting the physical standards,” Roberts said. He thinks certain aspects should be standardized, and Colcleasure agrees. He agrees the entry tests should be different between genders, because once they are enlisted, they can build up their strength, but before that, most women are inherently weaker than men. But with women now able to enlist in combat positions, will a revised Selective Service be proposed? Roberts says no − there’s already a movement to remove the national registration because it takes too much money to keep up with all of those draft aged men. He said it would cost twice as much to keep up with all women over 18 as well. He thinks the draft will be eliminated wholly, so there is no need to fear a female national registration. According to The Associated Press, a defense official said the military units must give their initial implementation plans to Panetta by May 15. The general consensus is that high-danger combat forces, such as special operations, the Navy SEALS, and others will have to keep their standards high even for women if they want the new positions to work out. Panetta proposed in January a revision to defense policy overturning the 1994 ruling that bans women in the military from serving in smaller ground combat units, known to civilians as infantry divisions. This change would allow women to serve in potentially hundreds of thousands of front-line positions, as well as higher-ranking infantry jobs. Panetta’s ruling gives military services like the Army and the Marines until 2016 to decide on any exceptions they would like made to this rule if they believe select positions should remain unavailable to women. Kendra Geer is a communication major from Mineral Wells, Texas.